Does it seam like fashion "week" has been going on forever to anybody else? New York, London, Milan, Paris - it has really been a fashion month full of street style to admire. Many jet setting, show hopping fashion influencers have been keeping it classic in black and white - a look any woman can emulate for a touch of Parisian chic! 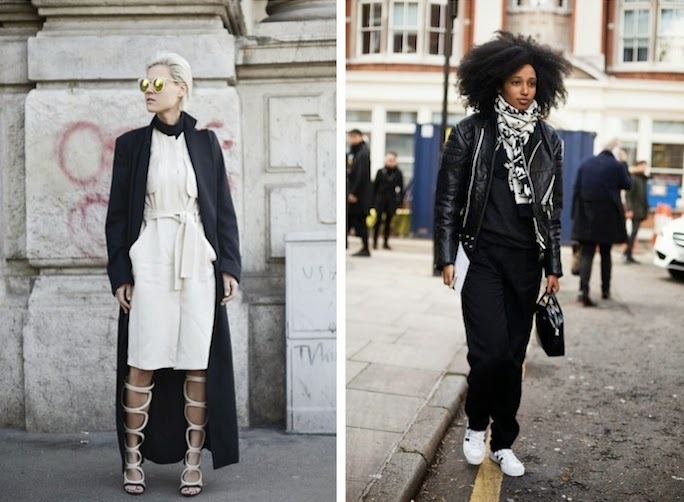 For a laid back look in black and white try combining things that most of us fashion gals either have in our closets already or are leaning to buy: a Leather Moto Jacket +Adidas Originals Sneakers + Printed Scarf. As fashion month goers know, black and white dressing allows for the ultimate in texture and silhouette mixing, making it the perfect way to show off a trend on the edge or stay understated yet chic in the classics. If you are looking to make a statement in monotone and want to shop for just one or two new items you must have an Oversized Fedora and a Blazer Cape and White Jumpsuit wouldn't hurt either;). In love with your super amazing photos! Black and white matches perfect. That is so exciting! Congrats! Love these beachy outfits!